My Feelings pages in Health Care Transition Workshop. Marilyn sells Adult hats and Child-size hats. We had a fun day together. I saw lots of friends and sold lots of pot holders. Grandma and Grandpa took us out for dinner at the restaurant! It was Chinese. It was delicious and a little bit spicy. Matthan brought me home. Mom was sound asleep in bed. So she got her sleep and I got my Symphony! Thanks Matthan for the ride. Sunday, I played games with Grandma and Grandpa. Monday morning there was snow on the ground! It was crazy and I did not feel very good. My Mom thought it was because I stayed up late to go to the Symphony. Silly Mom it was not the Symphony it was the snow! Calling in sick for work. Sierra just finished her presentation about Depression and Disability. It was so sad. Now she feels better. She has a new house and a new job for speaking about mental health. I took pictures of Sierra. I like to hang out with Sierra and my Consumer Advisory Council friends. It was a fun Conference. Wednesday started with a presentation about tools for independence at work. I like to present with Isaac and Theresa. I talked about my destination box. Then I presented with Danielle, Sierra, Theresa, and Kim. They talked about going to college. I talked about things to do on Campus besides studying. I work and exercise on Campus. Thursday morning we had our Consumer Advisory Council meeting. I wore my Guatemala dress to show my friends. Photo of . . . In the after I helped with Show me the Money workshop. We played Bingo. I presented with Tracy and Maclaen. My last presentation was my favorite. I was in the bathroom just before I was to present and the fire alarm went off! It scared me—such a loud beeping. My Mom had to come get me to go outside. I hung out with Heather and showed her my portfolio. She showed me her wedding pictures. I love wedding photos: such a pretty dress! Then it was time for the last workshop of the day. I showed my feelings notebook in Health Care Transition Workshop with Isaac and Kim. I remember to drink water and go to the bathroom by myself. I looked smart and competent. I saw lots of Big Sky friends. I saw Weston who is a Senior. He will graduate 2015! I ate lunch with mom and old friends. High School is all done for me. We talked about Adult life choices. Back-to-school is in the air! Campus is busy. My Dad is teaching. The Writing Center is open again! Lots of log-in slips for me to enter. Lots of students, lots of energy it is fun! A couple of weeks ago, I went to a training meeting at The Writing Center. I met my new co- workers. I presented my portfolio–photos about my Adult Life and tips for helping me work well at my job! On Wednesday, I packed my backpack with my task list folder and my water-bottle. I forgot my key and my phone. Hah! So when I got home I had to go to our secret place for the spare key. I am the only one at our house who always remembers to put it back! Anyway, work was fun. I have my own desk now with a little lamp. Very professional. Back pack ready to go. On Friday Kelly had a back-to-School Party at her house! I was excited. In the afternoon after my adventure y Mom and I made Cashew-Parsley Rice and Gluten-free bars. I chopped the Cashews and I snipped the parsley. I did everything for the bars except measuring the sticky honey. My Mom did that for me. At the Party I was excited to share. My food with my friends. I got to try their food too! I was brave and said ”no thank you to Deviled- eggs and yummy bread and butter. I ate gluten- free food and I feel great. I took lots of pictures of hanging out with friends and eating dinner. I took a picture of Kelly cook dinner– she made a salad. Delicious! Gretchen made a wonderful chocolate cake. I took some home to share with Dad. Gretchen is a good baker. Last week I went to Billings with my friends on the Consumer Advisory Council. It was lots of fun and very exhausting! Tuesday morning was crazy! My mom made me try on my presentation clothes AGAIN! She was not happy. She didn’t think I looked professional so I had to try on more outfits until she was pleased. I love trying on clothes but this was too rushed because she couldn’t make up her mind and then I had to pack my bag. `Do you want to make pot holders in the car, driving to Billings?’ Yes, of course, I wanted to make pot holders in the car. But . . . I was distracted because I had three friends in the car. I am used to traveling with my mom and making lots of pot holders. But this was completely different and so fun! My friend Kim had lots of mischievous dog stories and she had a `running-out-of-gas-in-the-middle-of-winter’ story. There was NO WAY I was going to be able to listen to interesting stories AND make pot holders. At the hotel restaurant I ate burger, salad, french fries and ketchup. Actually, I did not eat the french fries because I was too tired. I put my them in a box for later. I saw my friend Maclaen having fun on the water slide but I was too tired. I wanted to go to bed. Before the big meeting Wednesday morning, my mom asked me if I wanted to make pot holders during the meeting. `Yes!’ But the meeting was so interesting that I did not make a single pot holder. `Mischievous Mathalia,’ my mom said because she ended up carrying my pot holder bag around the whole day. We ate lunch with friends and then rush rush to the Montana Youth In Transition Conference. At the meeting . . . I volunteer for a job. I presented in a workshop called `Let’s Talk About Money.’ It was really fun. We used `funny money’ to talk about paying bills and sticking to a budget. It was my job to collect the money while my friends were talking: `Rent is due’ `Pay your taxes’ `Do you have a car? pay insurance and gas’ `Do you have a pet? pay for food and shots!’ At first my mom had to direct me to the audience members. But at the end of the workshop, I did my own talking and collecting! I presented my powerpoint about filling out deposit slips and going to the bank. My mom worked on it while while I was handing out candy on Halloween night. In the morning, On November 1st, my mom made me catch up on my bank statements: July, August, September and October before I could eat lunch! In the picture we look rather grouchy; we had a good laugh and then went back to work and finished the job. At the conference I hung out with friends, passed out papers and talked about Emerging Leaders on the Montana map that I had made with Ellen. I had to read the stories of all the Emerging Leaders, find out where they are from and then find their hometown on the Montana map. I placed a pin in their city. I cut out their picture and laminated it for the display board for the conference. You can read about the Emgerging Leaders in Montana. I went to my friend Sierra’s presentations. On Wednesday she talked about being sad and how she started to feel better. On Friday she talked about buying her house! I finished the pot holder that I started in the van and I gave it to Sierra for her new house: Congratulations, Sierra. Pot holder for new house! I listened to many ideas about Adult Life Choices. And I talked loudly and clearly when I presented and when I talked to new friends and old friends. I had lots of fun! And I was exhausted. Every night after I finished supper, I was so tired that all I wanted to do was to go to sleep. And so I missed all the fun on the water slide! My friend Rachel, my mom and I made a video to share at the Missoula Aquatic Club Banquet May 2013. My mom printed and cut up 100s of photos; I chose the ones I liked; I wrote the captions and then I typed them into the computer. I selected the music and my friend Rachel came over and put it all together. Today my friend Christy taught my mom how to upload it and embed it in a post. I am excited that I can share it! I had wanted to tell all of you about a `normal’ week in my life but that post will have to wait. This week is crazy and it has barely gotten started! Well, I suppose that it started on Saturday when I had to practice my Webinar presentation in between everything else I was doing: swim practice in the morning; homework, emails and ushering at MCT’s Steel Magnolias in the afternoon. Steel Magnolias was a great play—very funny and very sad. I liked it a lot because it was all about haircuts and I thought that was very fun because I like to go to the hairdresser to get my hair cut. On Monday morning, I did not go to school. I slept in a little bit and then I did laundry and started packing for our trip. Then my mom dropped me off at the Rural Institute and Ellen recorded my presentation. 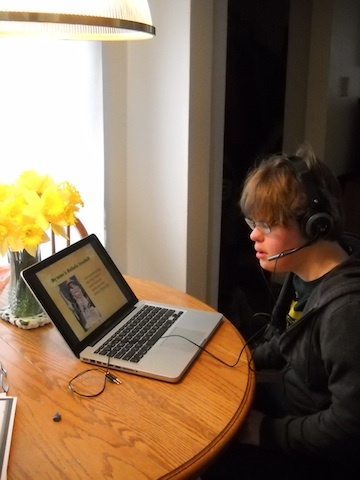 I presented my power point about how I use Assistive Technology to be independent during my daily life. I talked about using my Time-Timer at the Grizzly pool to know when I need to get out of the water after lap swim; or if I have get out early from club swimming. I talked about my bus destination file box where I keep all my little cards that I use to show the bus driver the destination where I want to get off the bus: library, Missoula Children’s Theater, Prudential, The University, or home. I talked about how I use my iPOD Touch to get up on time in the morning or sleep—or at least stay in bed–longer than 4:00 a.m. when I am excited about my day. I talked about my notebook that I use when I make my pot holder deliveries around town. Sometimes it is hard to hear me when the environment is busy with lots of people. I talked about how I use my Time-Timer Watch when I am working so I know when to stop working, clean up and sign out and go home. On Tuesday I got to sleep in again because we had another day of meetings. My friend Maclaen picked me up because my mom had to come a little late. It was really fun to see my old friends and meet new friends and have the meeting. I listened and I talked a lot. I talked about my favorite teachers and why I liked them so much. I got to learn more about the iPAD and other assistive technology devices such as swivel chairs and handles to help people get in and out of cars. We learned about making good food choices. I had to chose food to eat on a plate. It looked like real bread but when I picked it up, it felt really funny and rubbery. I did not want to eat it! For vegetables I chose green beans; for fruit I chose strawberries; for protein I chose tuna fish; for starch I chose bread. I took a picture of my plate when it was all full. Then I looked at the picture on the camera. It was kind of fun. My mom wants to go shopping to get some of those cool kinds of plates. So it was two whole days of meetings, seeing friends, eating delicious lunches and learning new information about my life after high school–my adult life. My mom asked about a microphone for me. They had one that we could check out for a month. I am going to try it out to see if people can understand me better if I have a microphone. Everyone said I spoke loudly and clearly during my presentation when I had a microphone so maybe it will help me in my daily life talking to friends and strangers I meet. At least we can try it out without buying it first–it is very expensive: $900! So now I have only one day of school this week and then California here we come. On Wednesday I have to remember lots and lots of paperwork for my classes AND I get to go out to the FFA Barn and buy an animal that I will take care of and then take to the fair in August. After this excitement, we will get in the car and start driving. I am excited to see Matthan and hang out with him and his USC friends. It will be fun. In the car I will make lots of pot holders and my mom wants to listen to the Iliad. What a crazy, wonderful, exciting week!